Ratings on alcohol, from vodka, bourbon and scotch to beer, wine and more. What is a Pineapple Orange Juice Peach Schnapps? Or is it called, Orange Juice Pineapple Peach Schnapps? Drink Recipes change with the season. While this one doesn’t belong on the list of Top-10 Mixed drinks, it does have it’s own special place for the autumn season. Just because summer is over doesn’t mean you cannot enjoy a good tropical drink. This delicious drink recipe can be enjoyed in the fall and makes an especially good Halloween, holiday treat. If Orange Juice and Peach Schnapps together are called a Fuzzy Naval, then Orange Pineapple Juice Peach Schnapps is aptly named, the prickly-fuzzy naval. Pineapple Orange Juice Peach Schnapps will bring the cold bite of fall into your favorite beach memories of last summer. The pineapple orange juice adds a little bit of tropical flare to the popular, fuzzy naval. One of the things this drink reminds me of is the combination of peaches and cream. If you’ve never had peaches with your ice cream, then you don’t know what you’re missing. The flavor of this combination is simply amazing. If you’ve tried the ice-cream treat known as the Dreamsicle than you’ve got the concept: Ice Cream and sherbet. The two were simply meant to go together. The flavor seems to explode, though, when you add the alcohol of a sweet liqueur, like Schnapps. 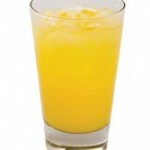 Pineapple Orange Juice (available at your grocery store in regular orange juice containers. The traditional way would be to use half and half of each of the ingredients above and add them to a cocktail glass with a cherry. 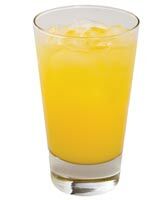 The preferred way: 3 parts Schnapps to 1 part Pineapple Orange juice, or Orange Pineapple Juice. Shake with 4 ice cubes, then strain into a martini glass. Add an orange peel for garnish.That, my friends, is a Pineapple Orange Juice Peach Schnapps….err.. or a Orange Pineapple Juice Peach Schnapps.